You are not allowed to discuss climate science, nor have another opinion. Our airconditioners are heating the world, our cars make snow, and heaters cause droughts. If you question these Factoids, you may go to jail. Even if the investigation or “case” never gets any further, the message is lit in fire. It’s practically a crime to doubt man-made global warming. Attorney General Loretta Lynch has considered taking legal action against climate change deniers. The United States’ top lawyer told the Senate Judiciary Committee on Wednesday that the Justice Department has ‘discussed’ the possibility of a civil lawsuit against the fossil fuel industry. She said any information her office has received has been sent to the FBI in a bid to build a case. I came across this too last night and send a reply in her site. It stated how the data is cherry picked from only a hundred years of temperature and how the government grants are one sided. And how the government is using this bad data to enforce a cap and trade policy. What a great idea. To take this matter to court would be the best place for both sides to put all their cards on the table. How do you think “The science is settled” “97% of scientists agree that man is responsible” and all the other related claims will hold up in a court of law? Bring it on I say. Open public debate would be great but not if the court was ran by a mob of Kangaroos. In court – the science wont matter, only the law will, and the law will be whatever the Judge says it will be. Back in the ‘fLaT eArtH days, it was much easier to determine who the judge was. I believe we are witnessing a revival of fLat eaRtH societal structures, this time instead of falling off the edge of the earth during a bit of a voyage to find out if there really is an edge, one ventures into the misty CO2 to see if one gets cooked in the CO2 global warming hell fire………………… To be continued…. I meant it was much easier to determine who owned the judge. The republicans will probably win the white house in the upcoming election. Both Trump and Cruz, the two candidates most likely to win the republican nomination, are both vociferous critics of the failed global warming hypothesis. A year from now the FBI will be probably be investigating climate scientists for fraud and violations of the RICO act. I can only say I hope you’re right and I’m wrong while at the same time I fear that I’m right and you’re wrong. I dread November’s election like no other in my lifetime. What is behind this is increasing hysteria among the AGW believers. With Trump and Cruz openly deriding their beliefs and drawing huge crowds is too much for them. They see their chances of imposing their beliefs on the masses disappearing. Hence this action to try and silence dissent. Unfortunately I can’t agree Eddy. Personally I believe Trump guarantees a Democratic win. Whether or not he is complicit in this is anyone’s guess but I simply cannot see the Clinton machine being outmanouvered. Remember the media are prepping America for their first ‘femme president’ and there’s nothing like a progressive precedent to stir the voting public one way or another. Having said that, there is an even more cynical part in all of this; entropy. I get the feeling American voters aren’t voting for Trump because he will be a tough/good leader…they are jaded by the political system and want to see ‘what crazy [snip] he’ll do’ and perhaps how fast America can fall into ruin. Kind of like the ‘rapture’ where christians seem more excited to watch those ‘left behind’ burning from afar than the everlasting bliss of heaven. When Reagan ran against Carter the early polls had Carter ahead. Reagan won by a landslide. This is going to be the dirtiest campaign in the history of US politics. Hillary is having a problem with a nobody socialist senator from the tiny hamlet state of Vermont and he is giving her several headaches, most recently by beating her in the rust belt state of Michigan. Trump will tear her to shreds. There is a populist uprising in this country that the talking heads, political pundits and the chattering class just don’t seem to fathom. The recent disruptions by the democrat machine at Trump rallies through their surrogates such as Communist radical Bill Ayers and the thugs at Moveon.com are going to backfire. Trump is a force to be reckoned with and he will pull in independents and Reaganite democrats in such large numbers that it will put states into play for the republicans that haven’t been possible in decades. Real hope and real change is coming! Given the illusion of power, that the USA still projects into the world, I also hope that Eddy is correct. I have to say that historically, his assessments have been pretty much spot on. Thanks for the morale-boost Eddy. p.s. I hope you are well – you have been missed mate. Thanks RW. I don’t comment as often as I used to but I still follow the comments when I can, especially from long time sage commenters such as you! I hope.Trump wins but there are very dark forces doing everything they can to stop him, including Zuckerberg of Facebook. In addition, as part of Obama’s strategy to destroy America he has enabled illegal aliens to get driver’s licenses. In many states this will allow such people to obtain voter registration, in some cases automatically. Obama has also made many people welfare dependent and also imported much illiterate riff raff from the Third World, many of whom hold hostile anti-American values. None of those people will be voting for conservatives. It is by no means a given that the Republicans will win but if they don’t you can kiss America and the West goodbye. You should study The Pentagons New Map written in 2004 and seems to being followed closely around the globe. What should be clear by now is that to get close to the reins of power you have to be a paid up globalist *first*. Let that frame how you view things…..then think about how someone like the US pres incumbent appears from relative obscurity, survives continued scrutiny of his bone fides and stays put despite evidence agsint him. Assuming history books survive, we will see the 21st century as the Age of Deception, where democracy was hijacked and a new Dark Ages appeared. In many states this will allow such people to obtain voter registration, in some cases automatically. Australia was doing this for years, all the time sobbing about ‘refugees’ who were nothing of the sort, propping up their paucity of real policy and promoting social engineering. It’s a disgrace. And the costs can be huge. Just ask Frau Merkel. There is even a name for this strategy. Developed fifty years ago by a couple of Communists. I think the Americans are accutely tuned to dangers to democracy. This is why there has been a massive surge in gun ownership recently -t eh Americans have athe pioneering self preservation/self reliance spirit, whereas Socialism requires total disarmement so peopel can be arrested and executed on a whim. The Consititional framers understood this very clearly, and the problem is in Australia especially, people dont study history to know it can all happen again. Australia also has a heavily socialist dominated media and stuff laughably called “news” that constantly hypes emotion over fact and never will allow proper debate on heady things like democracy and citizens owning arms, because if you boil it all down, what I have siad here is accurate. If you lok at the 20th Century, more people died from their own govts under Socialist rule 9 Mao, Stalin, Hitler, Pol Pot ) than WW2. America will be destroyed from wthin – witness the current neo-marxist incumbent who is creating society splitting tactics ( divide and conquer – the communist specialty ) to do just that and building massive internment camps under successive globalist presidents up till now – you dont build such stuff unless youre going to use it. The Soviets built gulags for “re-education” and execution…..
At a time when Republican opposition to President Barack Obama’s climate change initiatives is growing, the U.S. government announced Monday that it had deposited $500 million into the United Nations-backed Green Climate Fund (GCF). The payment marks the first tranche of the $3 billion the U.S. pledged for the GCF in 2014. I’m not American and I’m not a lawyer, either, so I am not terribly well qualified to answer, but I think the outgoing President can pardon only those already convicted, or, at least, charged. There’s no way that Obama can grant himself immunity from prosecution, other than by inventing some UN-based pseudo-ambassadorial post, with diplomatic immunity and a residence in the Bahamas (they have golf courses there, don’t they?). Eric Holder, for one, ought to be getting himself caught shop-lifting about now, so that his mate can magic his guilt away while he still can. It’s interesting, and one wonders why conservative interests don’t use the same tactics, they seem forever defending such attacks, it’s a wonder the offensive isn’t taken more often. For example why hasn’t greenpiss been sued out of business? They do enough damage, how about a RICO suit based on the damage their AGW stance does to poor people, perhaps 30c per kwh a 100 years of damage x 15 kW hours x 4 Billion people = $657,000,000,000,000 657 Trillion dollars in damages for preventing the benefits of electricity getting to those who need it. Greenpiss tell more lies than anyone. Makes a lot more sense than suing over sea level increase. Didn’t I read somewhere that GP spend 85% of what they collect trying to collect more? Because of the world-wide nature of the hoax, trials for all perpetrators should be held in single location, e.g., Nuremberg or The Hague or ?? The FBI should be investigating the AGW fraudsters now. The leaders of the fraud and all the major players belong with Bernard Maddof in prison who committed fraud on a much smaller scale and received 150 years imprisonment and forfeiture of $17.179 billion. Hence the AGW fraudsters should get around 10,000 years in prison and collectively forfeit several trillion dollars. Apparently the FBI (Federal Bureau of Investigation if you’re not familiar with that acronym) has been looking at certain oil companies and their executives for some time already. So this announcement is late in the game. It’s a blatant attempt to nullify the First Amendment to the Constitution. And given the current political and legal climate in the U.S., they might get away with at least starting criminal complaint referrals to the Federal Courts. So maybe James Hansen, who called for prosecution of these same oil company executives for crimes against humanity in front of a senate committee a few years ago will get to see it at least get started. Were I attorney general Loretta Lynch I would be ashamed to even think about doing what she’s doing. But our left branch of humanity has sunk so low that if it can’t win the argument on its merit, they will win the argument by force of legal action. Damn the bunch of them for this outrageous, contemptible action. If I ever wished I had an army with sufficient force to take over and stop all this it would be now. Thank God I don’t have such an army because in the end that much power would corrupt me as it has already done to Obama. We have failed to keep this president in check as congress and the courts are supposed to do so now we suffer for it. Is it any wonder that Donald Trump’s pandering to the electorate’s anger has gotten him so far as to be almost certain to be nominated by the Republican party? The outrage grows worse almost by the day. And it’s almost certain that Trump, despite his protestations to the contrary, cannot win the election in November. His chances are slim and none. When people say today that Hillary will beat Trump, that is because Republicans are still hoping for a better nominee but there is no such candidate. Once Trump is the nominee and he smooth’s out the rough edges, he will crush Hillary. Cruz and Rubio are establishment Republicans who are part of the cabal that insists on letting Obama do whatever he wants. They cannot negotiate their way out of a paper bag because they refuse to walk away from the table for fear of “shutting down the government”. The ability to hold back funding should always available but Cruz and Rubio gave that away when Obama promised to defund Planned Parenthood. Can you imagine? If Cruz and Rubio had waited one year, they could have brought up legislation to have private insurance pay for abortions. But no, they could not wait, and let Obama walk all over them, Again. Cruz is nothing at all like an establishment Republican. I disagree Roy and there appears an ever growing groundswell that express a similar view. More to the point though, it’s interesting to observe the presence of an habitual ease where the choice of the various electorates, we the people, may be disregarded, dismissed or marginalised when that choice is deemed politically incorrect. You have a lot of confidence in what looks like guesswork to me. Let’s remember something. Obama was elected twice with considerable help from out and out voter fraud. The very large body of evidence of this is in the hands of an organization called Judicial Watch. I saw one interview with someone who admitted publically right on the air that she voted multiple times. That same cheating machine is in place and I fully expect it to be used. They are also well organized to use social media and the Republicans as far as I can tell are nowhere near as able to do that. And then there’s the fact that Hillary is going around promising anything she thinks an audience needs to hear to get their vote. Free stuff was a deciding factor in the last election. Trump is promising only to make America great again, whatever that means. And it means nothing when you want goodies from Uncle Sam. Cruz promises to undo Obamacare the one thing that the free lunch crowd wants more than almost anything else. No, I don’t think it’s at all clear that Trump or Cruz, the only two likely nominees, can beat Clinton. Obama never had even close to a majority of the popular vote yet he won both times. What counts is votes when the electoral college meets to actually elect the president. And all that takes is to win in enough key states. You can ignore the rest for practical purposes. Anger isn’t enough and Trump is fooling himself if he thinks it is. The Constitution isn’t enough either and Ted Cruz is fooling himself if he thinks it is. The left thinks of the Constitution like it thinks of toilet paper. They do not care. And Republicans are working hard to derail a Trump nomination if they have to. We have become our own worst enemy quite literally. I disagree Roy, from this side of the world it looks like Trump will win the GOP nomination under protest of just about everybody, the fact that the republican ticket is more fractured depresses the Trump vote. But if the choice was Hilliary the e-mail queen or a Trump protest vote who would win. Trump being essentially independent is capable of tapping democrat votes as well, how much leakage will occur say in Florida because of the immigration debate or in say New England due to Trumps Business exposure? Only Trump in that battle is capable of growing the pie, Clinton will shrink it with even more greentape holding back industry from it’s potential. It’s exactly this that won Abbott the last election here, Trump has the innate understanding that the people want the nation to be great again, and that needs less regulation, less nanny-state rather than more. I think that enthusiasm, that shared frustration with the US slipping into socialist decay will get him over the line, at least it seems that way from here. Witness also Roy, that the more the other candidates embattle Trump the better he does, he is the underdog in this battle, so far he has barely taken a toothbrush to Hilliary’s record, I suspect he will demolish her over the e-mails, Bangazi and the like. He could make good ground taking on the EPAs overreach and it’s job-killing over zealous and for that matter hypocritical treatment of American businesses, the same businesses employing Americans. The removal of greentape is another big reason Abbott won here. People know it’s overreach, people want humans to come AHEAD of flora and fauna. I appreciate that you are on the ground in the USA and we are only seeing the international treatment but I do think that the drubbing of his competitors shows that once Trump turns his attention to Hilliary, she is probably toast. I could give you a dozen paragraphs about why I think taking it to court is a loser. But it boils down to this — and I made this argument to Rereke — there are no objective standards for judging the case. And the legal system breaks down when it has no standard for judgment. How can it decide anything? If someone commits a crime, what constitutes that crime is well known, being written in the law, so the trial is simply to determine if the accused did the act or acts that constitute the crime. But there is no doubt about what you must do to be guilty. But with climate change there isn’t an agreed upon, written in law standard about what constitutes a crime, for instance, being the infamous “climate denier” as we’re called these days. What does that even mean? Politics and personal biases will run wild with that. And the outcome could be anything. What law says it’s illegal to disagree with official opinion about something? And that’s what’s at the bottom of all this. Most likely the court will call in the “best available experts” on climate change. And we all know who they will be. All of them are in that 97% camp all the way. And we lose. RICO as I understand it requires someone to have committed or ordered someone else to commit a crime. What is the crime in being skeptical about the cause of climate change or some theory about climate change? Their only chance to prosecute anyone honestly will be if some oil company executives can be shown to have known CO2 is a dangerous substance. And how will they show that CO2 is known to be dangerous? Well, you call in an EPA expert who will quote chapter and verse from the IPCC (or if you prefer, Obama) playbook. And that’s the end. We lose under RICO too. This is really all about silencing opposition by making an end run around the Second Amendment. They don’t like anyone who may actually influence what someone else thinks running around saying I don’t believe this because… Science and law are both irrelevant except as tools to use for silencing the voices they don’t want speaking. Somehow I got this in the wrong place. It’s really a reply to bobl at #4.2.2.1. I’ve a browser that preserves what I write even if I change what I’m replying to and I must have let the mouse click on the wrong reply as I went back to reread what I said earlier. I don’t know for sure if it’s just Chrome or is built into the script for each page but I’ve been hit with it before and I just didn’t notice this instance of it. Computers are no end of fun (and opportunities to make mistakes. It’s one thing for the US Attorney General to sue the skeptics but it’s another thing to go to trial. During the discovery period the lamestream climate scientists and their supporters will be subjected to give depositions and the defense lawyers will force the plaintiffs to answer questions. This will be very interesting and potentially very revealing and detrimental to the plaintiffs !!! Good point. Hope it backfires on these people who have no idea how science works. Yep there’d be plenty of sticking points in such graphic evidence. With all due respect for your knowledge and experience, first steps first. If I thought I could get it I would want a completely neutral arbitrator, one well versed in both the scientific and political aspects of climate change, to examine all sides, all arguments and all evidence and make a binding ruling that either human activity has, is now or can in the future affect Earth’s climate or cannot effect it. And there is where we are stuck because after all the talking, arguing, blustering and now legal threats, we do not have an answer to that question. It remains in the subjective world, not the objective. And Diogenes is still out there somewhere with his lamp, stubbornly searching for an honest man he can never find. After all is said and done, we do not have a definitive answer. I know what I think and why I think it and certainly you can say the same. But there are no objective criteria for cross examining Michael Mann or oil company executives about climate change. And that is what makes any attempt to legislate the answer or silence one side or the other by threats of legal action so pernicious and dangerous. It is a return to the Spanish Inquisition. If we cannot resolve this by debate between the parties to the dispute on the merit of the science, we might as well throw away hundreds of years of learning how to resolve disputes and start resolving them with a duel or a war. I doubt that MIchael Mann started out to be anything even close to dishonest. But he was caught up in the thing and let’s face it, his career depended on his being right. And frankly, I think my future and the future of my grandson depends on my being right. So where does that leave us? I’m willing to live with the findings of honest open debate on the merit of the science. The other side is not. We can go nowhere from here except downhill unless something change drastically. I don’t know about that, here is my line of argument. 1. Cooling and Low CO2 are even more dangerous than warming and high CO2, expert witness at 200PPM plant growth all but stops! The Warmists have failed to provide due diligence in considering the other side of the equation. Establish that it is not the effect of CO2 that is being questioned but rather whether it is damaging or not. Whether CO2 rise is good or bad for us. 2. Given Cooling and low CO2 is more dangerous that warming and high CO2 it is clear that there is a minimum danger point of CO2 too, the research has not yet established what the “Optimal CO2″ level is. Point out that the EPA finding of CO2 being a pollutant ignores the fact that LOW CO2 is not just damaging but FATAL to all carbon-based life. Raise argument that Optimal CO2 is much higher than now (Even the IPCC says this). And that the government (litigant) is actually knowingly trying to drive the nation TOWARD that fatal outcome which is a dereliction of its duty to protect the nation. 4. I’d show that it matters where and when warming occurs, eg if a place goes from say 0-40 Ave (20) degree temperature and becomes 15-35 (Ave 25) the temperature has risen 5 degrees on average but the temperature range (climate) has actually become more moderate ( warmist need to prove that wont happen when all our experience says it DOES) and more hospitable to humans. I’d also point out that if warming is at the poles or over the oceans or only in winter or only minimums then the damages (to persons eligible to have court standing) are zero and that modelling does not work to answer these questions. When it inevitably comes up, I’d also point out that polar bears don’t have legal standing to address the court. 5. Countersue that the government is knowlingly damaging the nation with its low CO2 policy through it’s attempts to induce a famine establishing that you are justified in taking a stance against CO2 reduction by way of its effect on food production. Make them the defendants. But like Nuremberg RW, further unpleasantness may have to pass, a crescendissimo of truth if you will, before such eco-provocateurs are formally held to account, if indeed they ever are. I was thinking more of Pope v Galileo Galilei. How is Mann v Steyn going? Is this the model we look forward to? This is the face of tyranny. If there is no physical evidence required for prosecution; simply an allegation of a possibility of harm in the indefinite future, then you’ve built yourself a happy tyranny. Ahh yes, but you can PROVE that LOW CO2 is Fatal. CO2 is an essential neurological regulator. Low CO2 induces respiratory failure. They’re looking in the wrong place for signs of racketeering. Look instead at the IPCC and the government agencies that have enabled the most egregious misrepresentation of science ever conceived for the purpose of fraudulently coercing the transfer wealth from the developed world to the developing world under the guise of climate reparations. If this isn’t racketeering, what is? Could certain people be asked why they believe that natural Climate Change doesn’t happen? All those claiming that current temperatures are higher than they have ever been, for starters, or those who wanted to “get rid of the medieval warm period”. A change of President might well see these proceedings directed elsewhere. In that case arrange the words Petard, Own and Hoist into a well known phrase. Speculation but interesting angle on this issue. There is little doubt that changing global warming to climate change was brilliant. Captured the language? Only if the right does not speak up. Sadly, here in Australia, it doesn’t even try, with the leadership cowering instead from the job of addressing an organised foe. It is left instead to people like Jo and David to maintain the truth, and to allow us some small say and a reliable source of information. Not true. It has never been the IPGW, it was IPCC from the start. “Hillary Clinton mustered her best Sen. James Inhofe (R., Okla.) impression during a grassroots event in Nevada on Wednesday afternoon when she pointed to snowfall in Nevada during the month of January as proof [Global Warming] is real. In Charles Krauthammer’s view, what Hillary did is worse than what Edward Snowden did: “What people have to understand is that there is nothing higher, more secret than an SAP. And that, from some people I’ve talked to, this is worse than what Snowden did, because he didn’t have access to SAP. Speaking of Edward Snowden, there is an interesting interview he did recently that concerns the activities of the CIA relative to “global warming”. I would like the legal beagles to consider the government’s fiduciary duty, and refrain from harassing “climate sceptics”. Let’s consider wind energy, one of the many dubious schemes under the green energy umbrella. How do you tell if a windfarm is producing energy? You DO NOT count up all the kwh it produces and say that you have saved, for example, 400 grams of coal for every kwh the windfarm puts into the grid. Don’t forget that 80% of a windfarm’s production comes off-peak and is intermittent, therefore causing inefficiencies with the base load generators. No, the only way to tell if the windfarm is producing anything is to compare the efficiency of a grid before and after installing several windfarms. In other words, DID YOU use less fossil fuel after forcing the utility to accept wind generated power? I am very cynical: I don’t believe that a windfarm even begins to pay back the energy it took to build it. You can measure the output of any generation device by recording its power output (in volt-amps) over regular time intervals. Where you measure it, depends upon the physical design of the unit being measured (does it have a slipping clutch, for example). If you have lots of devices, of different design types, that are geographically dispursed, with different time references, is when getting an overall output figure starts to become interesting. It could be motoring to prevent the bearings from Brinelling when winds are too light to produce any rotation. Vibrations of moderate magnitude on stationary roller bearings produce local pitting because the local “point” stress is theoretically infinite. The magnitude of the stress is well in excess of the nominal yield point under rotating operation of the material. When however the bearing is “cyclically” loaded by vibration and not rotating, it’s only ever the same area of the bearing race that is “massaged”, resulting in local metal fatigue failure in the form of pits. Once pits have formed, the bearing runs rough and the resulting vibrations are transmitted through the structure and rotating components to other bearings (and other components), shortening their lives. The pits increasing friction — leading to perhaps excessive heating which at first reduces the internal lubrication and consequentially more heating; powered by the wind/motor. A fire cannot be ruled out. Another reason why turbines are motored when there is insufficient wind, is to reduce the possibility of large chunks of ice forming. Another way of preventing the formation of large chunks of ice employed in e.g. Sweden, is to embed heating elements in the blades. The electricity to power those heating elements is taken from the grid. Perhaps you can work out how much electrical power is required to keep a surface area of around 100 m² above 4°C when ambient air temperatures are e.g. below -20°C. Such heating is still required when the turbine rotates, but more power is required because there is “forced” convection over the surface. If ice is allowed to form, then once there is enough wind, chunks of ice break off, not necessarily symmetrically, so the turbine is thrown into imbalance. The ice that is thrown (has been known to be over 400 metres from the turbine) is a lethal hazard; it’s not just snowflakes but hard ice chunks weighing several kg; falling from an effective height of around 100 metres. A typical rifle bullet will have muzzle energy of 3800 Joules. That ice chunk has 3000 Joules from gravity alone, or 14700J including a horizontal flick from the blade. Crikey! The only way that’s clean energy is if it makes a clean kill. The final kinetic energy is the kinetic energy originally imparted by the blade, plus the energy transformed by falling from that height, minus the energy lost from air resistance during flight. Assume the field is full of spherical cows, assume negligible air resistance, assume "several" is 3kg, also assume the initial blade flick is perfectly horizontal (which could happen at the highest point of the blade arc). The time to fall 100m beginning with vertical component zero can be calculated, which is then also the time it took to travel 400m horizontally before impact. With no air resistance the initial horizontal speed is also the final horizontal component of velocity, and can be estimated from dividing the horizontal distance by the flight time. The two kinetic energy contributions can then be calculated and summed. d = ut + 0.5*a*t^2, but assumed u=0. v^2 = u^2 + 2ad, but assumed u=0. Just a few aspects of machine design taught to Mechanical Engineers ca. 1980. Even if you only just scraped through to graduate, you look at the wind turbine and should quickly recognize that it’s a really terrible idea from an Engineering perspective when there are better, more reliable and cheaper ways of producing electrical power. BTW: Vortex shedding produces transverse oscillations in the tower under very light winds. For tall towers, even with the stiff (thin shell) structures preferred by the industry, there is movement. Everything “rocks”; in the range of about 1Hz. The tower tries to move but the heavy generating gear and main spindle rotor “want” to stay in the same place. Recipe for fatigue failure on inter-connections with little or no wind. Also, I would like to know ineffient base load coal stations become when constantly being ramped up and down to accommodate the variable output of the wind and solar fantasies, not to mention wear and tear doing this. I’ve always felt that windmills could never repay the energy and materials costs involved in producing the wretched things. The waste of resources used in these bird and bat mincing machines and the eyesores that they are in areas of great beauty leave me angry beyond any words I can find. Windmills in particular, to make a CO2 saving, even if you could shut down the equivalent coal capacity (which you can’t because of reliability criteria) have to make up for the CO2 sequestration lost that removing the trees to place the windmills causes. That’s a loss of sequestration of about 500 Tonnes CO2 per ha or about 2500 Tonnes per annum per 1 MW windmill (which take about 5 Ha each) at 0.97 Tonnes per MWh (8497 Tonnes per MWh per annum) a windmill would have to have a capacity factor of 20/85 = 0.23 to even make up for the loss of Sequestration before any of its build costs are even made up. Windmills cause MORE CO2 to be emitted not less. Coal fired stations do not ramp up and down, they operate regardless as if they shut down it would take them up to 3 days to start up. That is why Electricity Companies in Germany are losing lots of money, because they have to dump that electricity at a cheap price whenever there is a lot of wind. The wind farmers don’t care what price they get, even paying people to take it, as they get a high fixed subsidised price. The more flexible types of generation (gas, hydro) are more flexible with lower emissions but more expensive to run, so are being driven out of the german market, even being shut down and demolished for relocation in other countries. The net result is that as the amount of renewables rises in Germany, the overall emissions are rising. Not quite what was intended. Ok, my error, I knew that but wasn’t thinking. Nevertheless, it must still create a lot of extra wear and tear on load following powerplants which, while they are in fact designed to vary their output, must wear out much faster with the rapid adjustments required to back wind and solar than with more slowly varying loads. I often wondered how to get a 50 ton rotor spinning at 3000 rpm to ramp up and down? It is difficult to measure the effect of wind electricity because of the mixed nature of generation. Joe Wheatley managed to get a figure for Ireland. Published but behind a paywall. “a calculation which indicates that CO2 emissions reductions associated with wind power were 0.279 tCO2/MWh for the Irish electricity grid in 2011. Wind power met 17% of electricity demand that year. Such savings are a lot lower than have usually been assumed. Most grid operators do not publish official numbers on the effectiveness of wind power each year, despite the large investment going into this technology”. In essence, at 17% wind there is a 9% reduction in emissions. Above that the savings reduce, so much so that high levels of wind energy may result in extra emissions, e.g. 40% wind, 66% MORE emissions. And when the turbines catch fire there are more emissions. 0.279/0.97 (0.97 T/MWh is the emission for USC Coal) implies a reliable energy capacity factor of 29% – this is practically impossible read “Undoubtedly wrong” as Wind power cannot directly displace coal energy because of the reliability constraints. More likely Wind power displaced Gas generation and the correct figure for CCGT is around 0.44 Tonnes per MWh 0.279/0.44 implies a 63% Capacity factor. It seems unlikely wind in the UK got anywhere near 63% CF. My guess is at best the windmills might have achieved an effective CF of 15% giving 0.15*0.44 = 0.066 Tonnes per MWh, or around 578 Tonnes CO2 per annum per MW (nameplate), which is 1/5 of the amount of CO2 that could have been sunk if the same land was left as forest. This implies CO2 Cost is around -1.28 Tonnes per MWh that is the emission is 1.28 Tonnes / MWh MORE than CCG would have produced without the windmills, if the land the windmills were on were simply forested. Just as a matter of interest the 31 Windfarms connected to the SE Aust. grid have averaged a bit over 10% production for the past 12 hours, and roughly around 20% for March so far. Included in that period have been one 24 hr. period of less than 10% and more of shorter durations. So 600 to 700 MW from 3660 MW of capacity is hardly productive. In Spain there are 23GW of windfarms which produce annually at about 25% of capacity. The real question that has to be addressed by the pundits, politicans and greens is what do we use for back-up power the other 75-80% of the time when there is little or no wind? Solar is only good for 6 hours a day, so it’s either nuclear, or coal/gas/diesel. Tasmania having sold-off their hydro is opting for diesel, and a little gas, as their 2 windfarms rates at 203 MW are not contributing very much. What is never ever revealed by the wind turbine industry is the amount of unmetered and therefore unpaid for power consumed by a turbine when it is idling and / or stationary. Nacelle electronics, turning motors, blade feathering motors, oil heating to keep gearbox oil at running temperatures, critical considering the biggest fail point in turbines is the gearbox with a less than ten year average life span for turbine gearboxes according to various contracted turbine maintenance people, data communications and in colder climes, de-icing of the blades which can consume half again as much power whilst idle just to keep the blades ice free by heating the leading edges. All up it appears that a turbine at idle or even stationary uses roughly 8% to 13% equivalent of its average power output when it is generating and that only the actual generation of power only comes in at a “claimed” high of around 28% of plated generating capacity for brand new, [ declining at 1% to 3% per year after Year one, ] land based turbines down to less than 18% of plated generating capacity for Germany’s fleet of land based turbines and dropping as even more of the whats left of the mediocre wind sites gets loaded down with turbines. 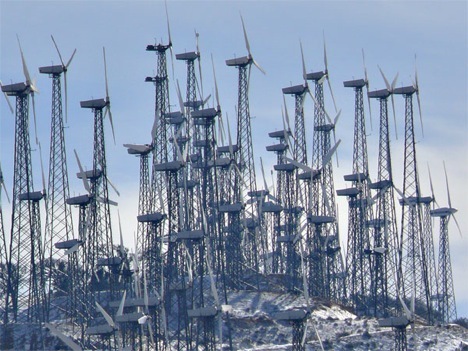 The best and windiest sites in Germany are long gone under a forest of turbines. The above chart shows the minimum productions plotted against the minimum wind speeds. As you might expect, whenever the wind speed is above the 3.5 m/s cut-in speed the turbine starts producing, but not getting consistently into positive territory until about 4.5 m/s. Notice the results when the wind doesn’t get above 3.5 m/s – typically there’s a MINUS 50kw of production. This is power that must be supplied from the grid just to keep the turbine in business. And 50kw seems to be what the turbine uses to stay alive in good weather. In the winter it gets slightly higher – the highest negative numbers were in the 80 kw range. So, finally, we have a measurement of just how much electricity they consume! 50 kw is quite a bit higher than my previous findings, which originated in industry statements and cash flow calculations. Recall that the average Danish turbine produces about 376 kw (1650 * .228). So a V82 operating in Denmark consumes roughly 13% of what it produces. No wonder they want to keep this quiet. To try and make my post above a bit simpler to understand although it is an approximation only. It appears that the equivalent of the total of KWHrs of power produced over time by any one turbine out of say every ten turbines, is subsequently consumed by those same ten turbines whenever they are idling or stationary or just parked and not generating power themselves, just to keep their systems running. The power consumed in these circumstances is just to keep their electronic, electrical, hydraulic and mechanical systems up and running ready to be switched into the generating phase when wholesale electricity power prices and / or meteorological conditions suit. The more I read on turbines, the more I am becoming convinced they are actual contributors to increasing CO2 levels through the secondary effects such as construction and transport and mining of the ores and the cabling and most of all the loss of maximum efficiency in the absolutely essential back up fossil fuel plants due to lower fuel burn efficiencies and thus more CO2. Renewable energy does NOT REPLACE fossil fuel or nuclear power generating plant. Renewable energy merely temporarily DISPLACES fossil fuel or nuclear power generating plants which have to kept operating and in place as the backup systems when renewable energy goes OFF line. And does so usually very rapidly with NO predictability what-so-ever. Such as when it gets dark [ solar or a total lack of ] or too calm, too windy, too cold, too hot [ nacelle fires , a occurrence to be dreaded in SE Australia’s northerly wind 40C plus days. Mind you, more CO2 even from inefficient fossil fuel fired generating plants is very definitely beneficial to all life on earth. Be it a primary effect as in boosting plant growth or a secondary effect due to more plant growth and therefore more feedstock for mobile life forms at all levels. That one item to me is the single worst example of political anti business bias and political corruption and sheer bad, business, industry and economy destroying politics that renewable energy pushing politicals and the green blob have foisted onto the unsuspecting public for close on three decades now. For an economy destroying piece of legislation and deliberate gross bias against cheap, affordable and efficient energy production, remembering all the time that our entire global civilisation is now an energy based civilisation in its entirety, that badly biased piece of legislation, in fact destructively biased against all other types of energy generation would have to be one of the most pernicious pieces of legislation ever passed by western governments everywhere that renewable energy has been promoted. The renewable energy outfits have now had some three decades of massive government subsidies and a legislated first access to the energy market before and over and above every other energy generation type. The renewable energy industry as had three decades to improve its energy production and become competitive in both reliability of supply and in its cost of energy produced. Despite the lavish funds and subsidies and the passage of a thir of a century to make advances, it has failed totally in every way to to improve their efficiencies and reliability and predictability and to be competitive with all the other energy production systems. Yet they still scream like stuck pigs the moment there is even a hint that they might have to soon compete on the same non subsidised and cost based access footing as other energy generators as they demand and claim they need those massive subsidies and exclusive first access to the grid to survive. Well after 30 years of being propped up by the tax payer who was and is never given a say in any this as to where his / her dollars are expended or what he/ she thinks they should have to pay for energy, its time for the renewable energy industry to shape up as an self funding and self competitive energy production system. If they can’t manage that then get the hell out of the way and allow the economy and industry and the grid operators to find their own best and most efficient power generation systems without the damn interfering and ignorant politicals forcing everybody to buy grossly expensive, utterly unpredictable renewable energy to run the nation’s industry and domestic affairs. As the money has run out as in Spain due to the renewable energy subsidy system corruption as has recently happened, is now happening in the UK, is happening in Denmark the home of a couple of the biggest wind turbine manufacturers, it is happening in Ireland, it is now being mooted in Germany as their grid gets close to collapse from the unpredictable and very large variations in renewable power coming on line or just dissapearing in minutes as the wind changes and drops off, the renewable energy industry will find out for itself the very hard lessons of real competition that is competing for the consumers dollar on an equal footing. The current legislation giving renewable energy mandated and first access to supply the grid requirements was and is legislated stupidity in close to its purest form. And with the amount of money being taken from the poor in the form of unaffordable renewable energy costs and transferred to the wealthiest wind turbine investors it is grossly corrupted capitalism in its most iniquitous and evil form. And none of the above even touches on the amounts of compensation likely to be awarded to those whose health has been severely affected by turbine infra-sound as further research verifies what is already suspected and known and begins to build a very serious and comprehensive case against the turbine industry and governments for massive compensation to those affected. I know Tony from Oz could put this in a better way, and I know that Science was my main weakness at school/uni, but I thought the best way to demonstrate how much has ben “saved” by so called renewables ( hydro needs to be excluded from this description, but I guess we all know that ) would be to count how many hours Loy Yang, or Hazelwood or Baysswater e.g. have NOT been producing due to the output of said renewables. I doubt you could count it in minutes, let alone hours. She needs to Indict Hillary first before she has any credibility. In the case of science, she has none at all. Here is an interesting piece done for Fisheries Nation. Environmental Bullies: How Conservation Ideologues Attack Scientists Who Don’t Agree With Them. In science, there’s always disagreement among experts and well-respected, conscientious non-governmental organizations (NGOs) working on tough questions. We are used to that. And we work things out as a team using objective scientific methods and evidence. A good scientist should be ready to make mistakes, to be wrong sometimes, to be called out, or to miss something obvious that someone else runs with and gets credit for. Or to get lucky with research, to be in the right place at the right time – we experience it all. And woman scientists that make it all the way to professional positions most likely have already been hit on or harassed or received unfair treatment, because there are fewer of us. Women scientists know plenty of these stories. We receive training for that too, even though it rarely helps. But I was not trained how to respond to environmental bullies. Or scientific fraud. How do you react to false, deceitful accusations from non-experts, from unethical individuals, from persons or NGO’s with books to sell, or a point of view to peddle to an unsuspecting public or community, or politicians. Points of view, that when challenged by facts and data, get in the way of fund-raising campaigns, messages to the media, book sales, rich donors, and perhaps the most insidious – attempts to influence US fisheries and ocean policies. You might as well put the cuffs on me now, I’ll go quietly…..
No Oeman. Rage, rage against the dying of the light – as Dylan Thomas urged us. Having said that though, the probable reality is that all of our names are already on a watch-list, and if Hillary and Turnbull get in we’ll find ourselves in a Klimate Re-Education Kamp before you can say “hockey stick”. For lesser climate offences a 21st century version of the stocks might be employed where brain-washed teenagers throw rotten fruit at old climate deni*rs like us. I read this yesterday and watched a video of her testimony with a sinking stomach. I went looking for it again today and was quite unable to find it. The lack of insight engendered by this institutionalised dogma is exactly the same foundation stone laid in previous times that suspended all intelligence, wisdom and humanity, with well known consequences. People talk gleefully of court cases where Michael Mann is cross examined. They forget that there would never be any question about the perceived truth of the moment. It looks more and more like the Democrats ARE the Nazi party. All are globalists, they are just doing what they are told by their occult paymasters. There is no difference between republican and democrat – all are globalists, all follow the same agenda. There is politics, and there is real politik – one is for gullible public joe six-pack consumption, the other is reality. Considering the Democrats were pro slavery before and after the US civil war it’s supremely ironic they idolize their socialist black Jesus 160 years later. Anthony Johnson. Anthony Johnson was one of the first African Americans to have finished his services as an indentured servant and become a landowner on the Eastern Shore and slave-owner himself in 1655. I posted in the previous topic, not seeing this new one, so apologies for the duplicate post, but I think its worth reposting here. Beth i have seen this desolation of rusting eyesores, why is it that everyone else bar the green crap has to clean up after something is past its use bye date? California the epicentre of green crap. Not on the same scale, perhaps, but here in Melbourne you can still see the crosses, as in grave markers, painted on trees that were supposedly going to die due to a road upgrade nearly 20 years ago. Strange how the Green movement only worries about the conscience of others. The next batch of wind turbines in California should have to be built at Tehachapi, with the absolute proviso that the old junk is removed first. I deny carbon dioxide is pollution. I deny that modern coal fired power stations are dirty. I deny that CO2 is heating the planet rapidly. I deny that the seas are rising more than normal. TedF going the full Trump on the PC establishments, I’m with you mate! I remember Horatius at the bridge. He survived. I deny that more than 5% of the extra CO2 is man made. Would like to see as to how you arrive at that figure. Simple, On a beautiful beach, @ 90, bonking madly. 100 is the new 90…..
Those are fearful odds, and a terrible image! a) I deny that there is any variation in temperature other than the very gradual decline (with minute fluctuations)that is evident in the eight millenia since the Holocene Optimum. b) With out the fiction of “global warming”, I deny that “climate change” is anything apart from regional changes brought about by permanent variations in local weather patterns. c) I deny that human influence has anything but an insignificant effect on the massive power and forces that define the universe. And yes, if Billary and Maolcolm win their elections, we will all more than likely meet one day in a FEMA camp. I stand with you TdeF. Where are you going to nail it? I’d quite like to see that posted on the door of St Paul’s Cathedral in Melbourne. However, with the present hierarchy in the Anglican Church of Australia I don’t see it being left up there for long. They went down the lefty PC road long ago. Hopefully at the front door of ALL schools, everywhere. Careful what you wish for TdeF. On a related note, children suing US Government over “climate change”. So maybe our best response would be to all contact the DOJ asking for an update of their investigation and demand it be made very public when it is forthcoming. Wouldn’t they have to back off and admit failure or expose themselves and the administration to constitutional inquiries? They have been playing opportunistic dirty pool with what they call the Republic* for a very time! Sovereignty of the People indeed! Dr David Whitehouse (GWPF) is a real scientist and this a top vid presentation of current CC thinking. You can do worse in a court of law than have all the facts on your side of the argument and it is the warmists who have been caught hiding the decline. Who then is the denier? Even the word ‘pause’ is denial, not stopped or peaked or limited or turning point, an old favorite of warmists. Why is it a pause? Pause implies temperature is ready to go up again and rapidly but after 18 years there is no indication of that at all. ‘Natural variation’ has now come to mean whatever was left out of the comprehensive climate models which was apparently far more significant than what was in them. How can anyone admit this with a straight face? We were completely wrong but at least it was natural? Now that’s real denial. At the moment I would guess there is a desperate homogenization fight worldwide just to keep world temperatures from going down and the massive growth of ice and sea ice in Antarctica is just a ‘puzzle’ for NASA when it should be a total contradiction of predictions. Then there is the rapid slowing of the steady sea rise, another indication that either the water is being ‘stolen’ like the stolen heat or the missing water is responsible for the remarkable growth in ice in mainland Antarctica as arithmetic indicates. It seems the whole warming industry is in denial. So then go ahead and sue me for stating the facts. While this comment relates directly to Comment Number 9 and all the responses, I’ve actually made it a separate comment to draw your attention to it specifically, and not have the comment directly nested to another sub comment in that nest of comments. Most climate believers just believe, the green supporters, not the actual Scientists, because those actual Scientists are above all of us plebs to actually leave comments at sites like these, so it’s just those outright believers, who without the actual Science knowledge, just snipe away at those of us who do ask questions. Now, unlike them, I try and chase down stuff to actually show you all, and then, with that actual backing, you can base your understanding on actual data. So, rather than just believe me, go to the link I provide and look at it for yourself, and while I provide some information on what to look for, do the Maths yourself. Don’t just believe me. Okay top line – Coal. Now first, go across to Generator Retirements. Note the first number, actual generators. (not whole plants, but units, the generator unit itself) That number is 53, and the total MW (Nameplate) is 5083, so the average unit closure is around 96MW. Some are large(ish) units but most are in the range below 50MW. Now these are old units, some very old,. The average age of these closures would be between 50 and 55 years, so they are old tech, and at the end of their lives. Because the grid has expanded hugely, those older plants have only been used as backup, because there are many huge plants now supplying the Base Load, and these smaller units are just used as rolling reserve, spinning reserve, in other words burning and turning, just not switched on to the grid, until actually needed, and more often than not, that is just for a few hours a day, those Peaking Power periods. Okay, they have closed down, gone. Now go down to the line indicating Natural Gas. (NG) First subtract the closures total Nameplate (4184MW) from the new Nameplate (9275MW) and that leaves 5091MW. Umm, say now, isn’t that the same number as closures for coal fired power. Those ….. new ….. NG Plants, unlike rolling reserve when they still burn all that coal, actually can run up at a virtual moment’s notice, so instead of running all the time, they now only run when needed. They fill the same job as those old tech retired coal fired plants, only supplying when called upon, Peaking Power periods of a few hours a day. In fact, in virtually every case those new NG plants have been constructed at the same site as those old coal fired units, so in effect, the power plant has just changed from old coal fired units to new NG units. So then, who gives a flying (you know the word) about Wind power and solar power. As you can see graphically shown here, not from me just ….. saying it, but from the data you can see with your own eyes, Wind power is not replacing coal fired power, and if it was, why then is there the need for all that NEW NG plants. Now, don’t fall into the trap of thinking that NG is replacing NG here, because 87 Units have closed and 92 units have opened, look at the Nameplate totals and take the retirements away from the new units. It’s the same Nameplate as for retired coal fired units. It sorta really makes you wonder, eh! Now, if, umm, if pointing out and explaining this actual data makes me a Denier, then I guess I’ll just have to live with that eh! In Germany, the NG is so expensive and the brown coal so cheap, that it costs more to keep the NG plant spinning reserve than the coal-fired one. So the new NG plants are being mothballed. The 1950′s and 1960′s builds of coal-fired plants are kept online way after the original end-of-life; as spinning reserve to fill the wind and solar power gaps. If it were not for wind and solar, those plants would have been demolished, not just mothballed a deacde ago. Were it not for terminal radiophobia, Germany wouldn’t be building more brown-coal-fired power plants right now, and strip mining its own coal to keep those and existing plants fed. The power generators are however privately-owned (though various governments own substantial shares) but are making serious losses in the conventional generation market because they have to maintain spinning reserves and, when there’s a surplus of “renewables”, they have to pay others to take away some of their base load generating capacity. COnventioanl generating companies are on the edge of insolvency. But the grid regulating authority requires them to keep that capacity available. They are not permitted to shut down that which is e.g. leading to losses to the tune of 10 billion Euros a year in just one company. They are the meat in the sandwich; a position that they managed to get themselves by embracing the nonsense rhetoric of renewables. Another major company, RWE, has split off the subsidised generating caapcity from the traditional and consequentially loss-making sides. I suspected that that was the first step to firewalling the company when the conventional generator declares itself insolvent. More than 95% of the electrical power produced by RWE in 2011 was from coal, lignite or nuclear. Insolvency would produce a national emergency to keep those plants generating. A modern, industrialised nation cannot operate on 5% of its previous electrical generation capacity. A popular word with warmists is ‘sustainable’. Everything has to be ‘sustainable’. What is sustainable about living above 40 degrees North without heating in winter? What is sustainable about living in the tropics in summer? Whole cities like Dubai (4.5Million) have extreme heat, no water and no food at all. Much of America is dependent on the 6 million trucks which roll every night (wind power?) and at the moment there are 3 million people in aircraft which are not sustainable without kerosene. We need energy just to pump water around our cities and take away the sewerage and light our streets. It doesn’t happen by magic. Public transport uses great amounts of fossil fuel. So the entire lifestyle of 7 Billion humans is not sustainable without fuels. No food, no water, no transport. Try all that on 5% of the energy and you will have to get rid of 95% of the people. Of course the Greens think that is fine, as long as it is not them. Greens voters always live in the richest countries with food choices, in the wealthiest cities, the most desirable locations and often in the inner city where they like the carefree lifestyle away from farms and factories and mines and often on the public purse. It is their lifestyle which is not sustainable and we cannot afford any more of their useless windmills and expensive solar panels. They are utterly indulged and in denial. I tried to post about this in the previous thread but it seems that the moderation robot is a tad sensitive, but thankfully there’s a human in the loop. Chris Horner: “The global warming industry, with its fetish for threats, intimidation and tantrums for silencing and even jailing its political opponents, is now calling on a politicized arm of the government​ as its muscle. This tells us that, even with all of their money, they are unable to persuade private sector attorneys to take their frivolous civil RICO demands seriously enough to take the case in the face of potential sanctions for doing so. I think u will find the Snowden interview didn’t happen. the website reporting it is not credible. the interview was allegedly given to Moscow Tribune, which shut down decades ago. Hard to know what to believe on the ‘net. google shows grouping of 440+ results for loretta lynch + climate + whitehouse. click on the grouping and you get about 8 results, the most mainstream being UK Daily Mail, which has now covered it. Breitbart is the next most mainstream. the rest are niche online websites/blogs. click on “omitted results” & you get 2 pages (approx 40 results) – the initial 8 regarding her climate denial remarks – with the rest being about Clinton emails and Lynch not wanting to be considered to replace Scalia on the Supreme Court. 11 Mar: Grist: Melissa Cronin: Will Exxon face a lawsuit for denying climate science? The Exxon campaign is not the first time climate advocates have suggested taking legal action to address climate denial. Last September, 20 scientists sent a letter to President Barack Obama asking federal investigation of climate science denial under the Racketeering Influenced and Corrupt Organization (RICO) statute, a 1970 law that allows civil action for alleged misconduct to be filed in state or federal court (a similar strategy was used against the tobacco industry in 1999). The implications of such a move are a point of contention for conservatives, like Walter Olsen of the Cato Institute, who argue the case could hamper advocacy and ***free speech. The chances of a DOJ review leading to an actual lawsuit is slim, but even the speculation of a suit means added public pressure on the fossil fuel industry’s associated political activities. If the feds really did bring a civil suit against the fossil fuel giant, then the message this sends to climate deniers would be all the more powerful. ***only conservatives are concerned about “free speech”? the progressive left has completely lost its way. The next US AG will hopefully focus on fraud, destruction of public records, influence peddling & theft from the public treasury. came across this by chance, while searching for something else! RT’s Simone Del Rosario speaks with media and legal analyst “Lionel” and takes a look at what the DOJ really has in store. Extraordinary. Law suits from children for government protection from Climate Change. The FBI investigating people who disagree that Climate Change is killing people. In the US, 13,286 people were shot dead last year and the FBI allows people to openly carry guns on the streets. Smoking has killed hundreds of millions of people, often by lung cancer but heart disease, emphysema known for four hundred years since James 1 of England. In the US in 2015, smoking killed 480,000 people. However I personally am not aware of a single person killed by Climate Change. I must be in denial and I will ask my neighbours. None in Australia at least and this despite our premier science body the the CSIRO stating that we have experienced devastating Climate Change, something the same 350 of our best CSIRO scientists are now working on alleviating. Some people may yet be saved. After 30 years of Climate Change, how many people in the US died from Climate Change last year? Anyone? Why are some young people in the US so scared of Climate Change that they are demanding government protection? Now what is this killer Climate Change? Please tell me what it is so I can understand what I am denying? After thirty years of this, the climate looks exactly the same to me here in Australia. No city or even beach house is under water. The summers and winters are just as I remember, but I admit I am not a professional Climate Change scientist like dead kangaroo expert Tim Flannery or billionaire ex Vice President Al Gore. They seem to be the only ones who know the terrifying truth. So who died from Climate Change in Australia in the last 30 years? Are Climate Change deaths only happening in countries without windmills and carbon taxes? NASA’s chief climate scientist, Gavin Schmidt, is hosting the Q&A portion of ‘Rap Guide to Climate Chaos’ performed by rap artist Baba Brinkman at the SoHo Playhouse on March 11, 2016. LINDA: What was the biggest surprise in your research for this show? note: Brinkman’s mother, Joyce Murray, came second to Justin Trudeau in the race for the leadership of the Canadian Liberal Party in 2013. RT, Fox and now NY Post, yet none of them showed up in Google searches! Unsure about climate change? Watch out: You may be risking jail. Fact is, climate-change science is still quite primitive. Neither Exxon nor anyone else has ever had definitive proof of anything about climate change. Testing assumptions is at the core of science, and Americans have a right to say whatever they want. If the true believers don’t like dissent, they’re equally free to refute it. If they can. Someone pinch me I must be dreaming. Words I never thought I would see reported on the ABC. The Word Heritage ice formation, which covers 250 square kilometres, is the world’s third largest concentration of fresh water and the ice-bridge collapse occurs every three to four years, according to National Parks Argentina. Experts said the collapse has nothing to do with climate change and was instead all to do with physics. The phrasing “instead all to do with physics” implies that “climate change” and “physics” are disjoint categories. That’s also the journo’s choice of wording, not a quote from the expert. Hey there USA Attorney General, you might want to ask the ABC a few questions. This documentary was made 26 years ago. Nothing has changed. Worth watching to see how accurate it was in 1990. Ive been trying for ages to get hold of a copy of Martin Durkin’s “Against Nature” for ages now, never been able to find it. Same era. Interesting response to advice given to Cruz re climate change. Gmail routes all traffic from the GOP-e and GOP candidates to junk mail. How is that for a “thumb on the scale of presidential campaigns”. Strangely I just noticed that this post does not show text at all on the front page, indeed, the text I wrote was not appearing at all even on the full page. I discovered some coding inadvertently copied from one of the sources which may have hidden the text from everyone except in my editing window. I read it this morning, so it showed on Firefox. I read through the comments under that video. There sure is a lot of anger in the US atm. And I notice Eli Rabbit has a different moniker there, but nobody seemed to pick up on it. Reading On Liberty from John Stuart Mill atm, and one quote resonates with me on this subject. I am sure that she considered all her options in trying to supress the 1st Amendment, until someone read the U.S. Consitution to her. you can, if you are the soughg of person who is Galactically incompetent ! And, if you are in a high enough position, you may impede somebody’s progress by threatening to. If the threat is carried out the fossil fuel industry should act like responsible corporate citizens and shut down the sale and production of all fossil fuels until the court case is settled. Heh. That would teach somebody something. Perhaps the Courts would learn just how much they rely fossil fuels. As does the rest of the nation. Once people realized it was fear mongering the persecution couldn’t survive. What about those who deny that we live in an Ice Age and that promoting Global Cooling in such a precarious climatic state is psychopathic? Global Warming is good. So, whether or not it’s warming, we still have a lot of ice to eliminate before the Holocene ends, otherwise we’ll have 90,000 years of trying to grow crops in the snow without a lot of precipitation from the lack of evaporation. Interesting turn of phrase, “build a case” not investigate if there is a case. Climate change deniers or Hillary Clinton?